In the wake of Lubaina Himid’s Turner Prize victory, she was the subject of several substantial features in magazines such as Vogue, and the Sunday Times Culture magazine. 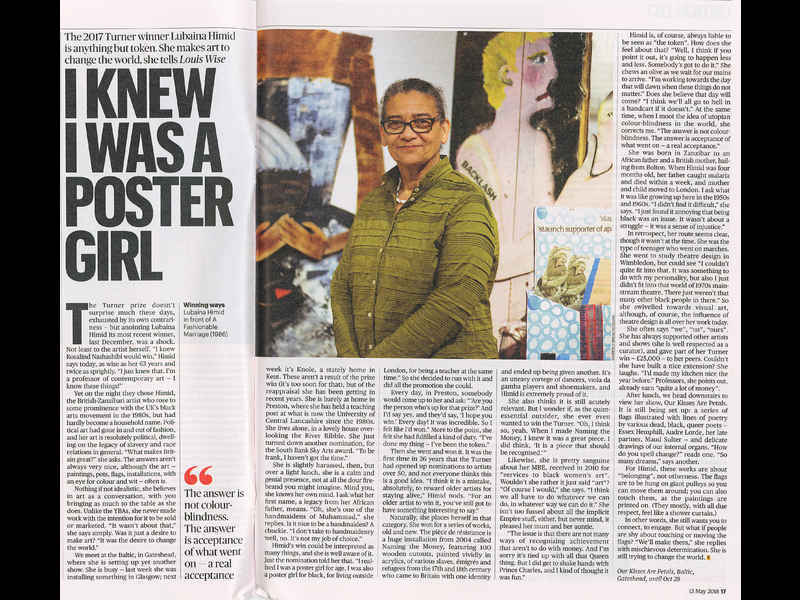 This feature, “I KNEW I WAS A POSTER GIRL”, appeaed in The Sunday Times Culture magazine of May 13, 2018, on pages 16 and 17. Written by Louis Wise, the feature was introduced as follows “The 2017 Turner Prize winner Lubaina Himid is anything but token. She makes art to change the world, she tells Louis Wise.” The portrait of Hinid accompanying the piece was credited to Darren O’Brien Guzelian. The piece trailed Himid’s exhibition at Baltic, Gateshead, Lubaina Himid: Our Kisses are Petals, 11 May – 28 October 2018. In a wide-ranging piece, Himid covered a significant amount of ground about her history, her practice, her MBE, the Turner Prize, and other issues. Yet on the night they chose Himid, the British-Zanzibari artist who rose to some prominence with the UK’s black arts movement of the 1980s, but had hardly become a household name. Political art had gone in and out of fashion, and her art is resolutely political, dwelling on the legacy of slavery and race relations in general. “What makes Britain great?” she asks. The answers aren’t always very nice, although the art - paintings, pots, flags, installations, with an eye for colour and wit - often is.